Swinub in game: 3,575 Who? Important notice! Pokemon Swinub is a fictional character of humans. 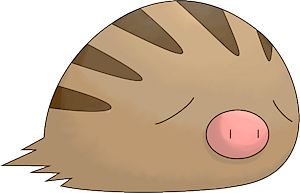 Living in frigid temperatures, Swinub is covered in dense, brown, striped hair to keep it warm. The hair is so shaggy that it often covers its tuft-like small legs, making it appear like a legless lump. Swinub’s eyes appear as if they are perpetually closed. 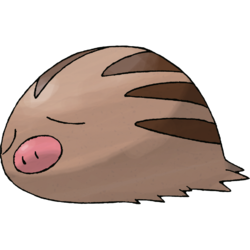 Swinub uses its pink, pig-like nose to dig through mud and snow, looking for anything edible. Occasionally, it will come across hot springs while scouring the ground. 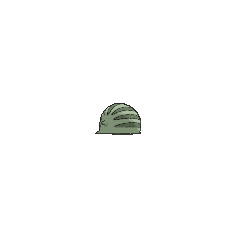 Its favorite food is a type of mushroom that grows beneath dead grass, though it also eats Berries. When a Swinub finds an attractive smell, it will run desperately to find out the source of the aroma. It inhabits cold places, such as icy caves, mountainous regions and frozen tundra. Dawn captured a Swinub in Hungry for the Good Life!. 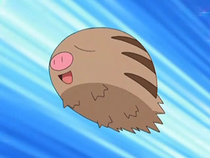 It evolved into Piloswine in Sleepless in Pre-Battle!, and then into Mamoswine in A Breed Stampede!. 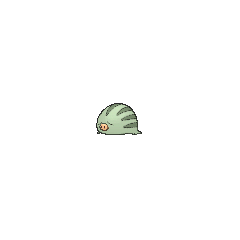 Swinub first appeared in Spring Fever. There were three named "Sue", "Ein" and "Ub", and they were used by Peggy and her father to sniff out places to dig for hot springs. One of the Pokémon that was with a Poké-Sitter named Matt in Pinch Healing! was a Swinub. Three Swinub were featured in Hot Springing a Leak! ; they were owned by Leona, one of Dawn's childhood friends. Two Swinub were among the Pokémon resting in some hot springs in Entei at Your Own Risk. A Swinub was used by one of the students of the Pokémon Trainer's School in Gonna Rule The School!. Swinub also make a cameo in Queen of the Serpentine. The little Pig Pokémon was one of Lucy's pets. Swinub also made an appearance as one of the Pokémon owned by Nurse Joy in EP250 and in Drifloon on the Wind!. A Swinub appeared in the opening scenes of Zoroark: Master of Illusions. A Swinub appeared in a flashback/fantasy in The Forest Champion!. 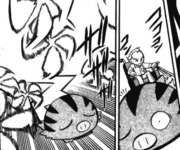 Swinub is seen as one of the Pokémon under Pryce, and is often kept on his lap when he rides his wheelchair (and during battle). When Pryce becomes lost in time, the Swinub is trapped with him. The same Swinub returned along with Pryce at Sinjoh Ruins, and it fought alongside with him against Dialga. Camper Yuki of Pokémon Gold & Silver: The Golden Boys used a Swinub in a tournament in Let's Fight! The Mini Pokémon Tournament where it fought against Gold's Elekidand lost. Swinub has the lowest base stat total of all Ice-type Pokémon. This includes the lowest base Special Attack and Special Defense among Ice-type Pokémon.